Coral Expeditions are a leading Australian cruise company offering Kimberley cruises from Darwin to Broome and Broome to Darwin. Coral Expeditions pioneered the concept of small ship expedition cruises and provides guests aboard the ship just the right mix of comfort and adventure along with unforgettable locations and scenery. 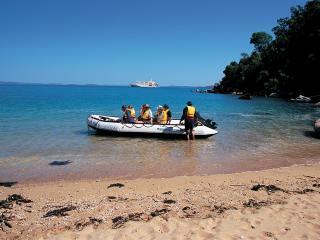 Coral Expeditions Kimberley cruise is an experience of a lifetime. The Kimberley region takes its evocative name from its most imposing landmark and ancient mountain range visible from the rugged sea coast. Covering more than 400 square kilometres in North West Australia it is a place universally acknowledged as the world's last and possible most beautiful wilderness. It is a place of magnificent vistas created by towering rock ridges, silent secluded gorges, wide savannah plains and waterfalls which defy nature. 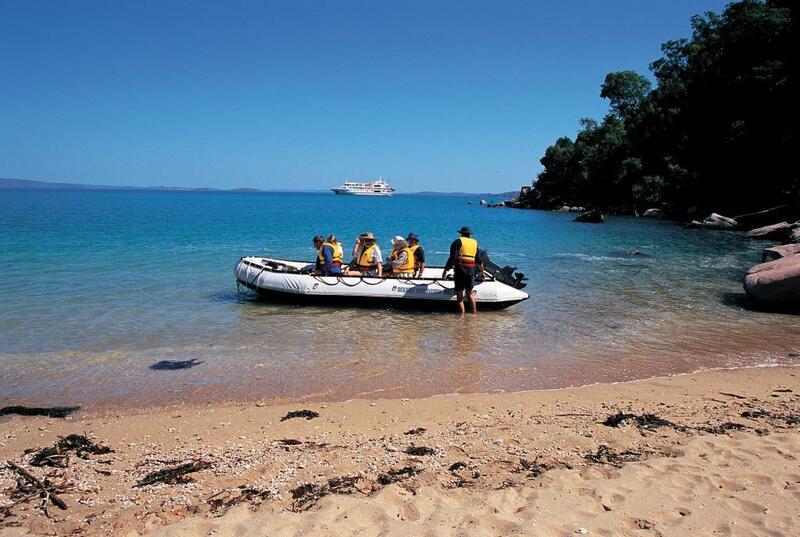 Passengers aboard this Coral Expeditions I cruise also discover Broome, the capital of the Kimberley that was once the pearling capital of the world as well as a chance to visit the heartland of Australia's northernmost unspoilt outback. Day 1: Board Coral Expeditions I in Darwin at 8.00am for a 9.00am departure. Farewelling Darwin Harbour, cross Cambridge Gulf and sail into Western Australian waters. This afternoon join the expedition staff in the lounge for an informative introduction to the Kimberley before meeting your fellow travellers and friendly crew at the Captain's Welcome Drinks. Day 2: Today you discover the first of the Kimberley's big rivers, the mighty King George. Aboard Explorer, the specially designed excursion vessel, you'll explore scenic gorges and in the inflatable zodiacs you'll cruise close to the base of magnificent King George Falls, the tallest single-drop waterfalls in Western Australia, towering some 80 metres above the river below. Later, we visit secluded Tranquil Bay for beach walking and exploration. Day 3: Join the Expedition Leader on a walk across salt flats to view the wreckage of a US Air Force DC3 which crash landed on the beach during World War II. Later, visit Jar Island and discover the islands outstanding rock art gallery. The Guest Lecturers will point out fine examples of the Kimberley's mysterious Bradshaw Paintings (Gwion), dating back some 20,000 years. Day 4: After anchoring in Winyalken Bay, travel ashore aboard Explorer to explore the maze of natural sandstone caves known as Hathaway's Hideaway. Later, helicopters are available for optional scenic flights over the Mitchell Plateau for close up views of the mighty four-tiered Mitchell Falls (additional expense). This evening enjoy a spectacular Indian Ocean sunset as you indulge in a gourmet Aussie Beach BBQ. Day 5: Discover the rock art gallery on Bigge Island featuring fine examples of both Wandjina and Bradshaw art. The Guest Lecturers will be on hand to explain these traditional art forms and the myths from the dreamtime that inspired them. 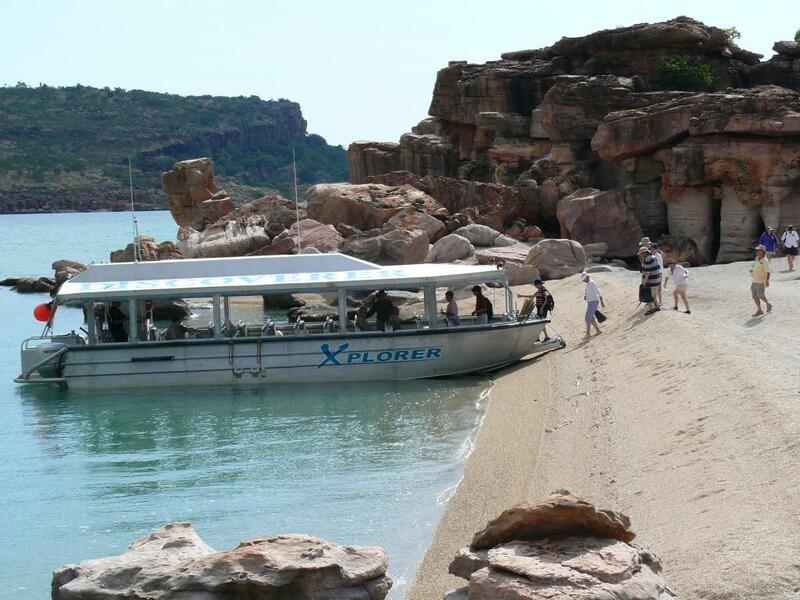 Then, explore Careening Bay which was named by early explorer Phillip Parker King after his ship "HMC Mermaid" was careened for repairs during his second voyage of discovery in the Kimberley. The lecturers will lead you to the site of a remarkable boab tree bearing the inscription "HMC Mermaid 1820", still clearly visible almost 200 years later. Day 6: Cruise the mighty Prince Regent River aboard Explorer to breathtaking King Cascades, an unusual and picturesque waterfall cascading over terraced rock formations. Enjoy a picnic lunch at beautiful Camp Creek, where there is also time for a cooling dip in the freshwater pools. Day 7: Today savour a truly unforgettable moment as Montgomery Reef rises out of the ocean as the tide ebbs. Join the Expedition Staff aboard the Explorer and zodiacs to experience this natural phenomenon up close and discover the reefs diverse marine life including turtles, manta rays and reef sharks. Later, cruise through scenic Doubtful Bay. Day 8: Cruising through Kuri Bay, home of the south sea pearl industry, travel ashore at imposing Raft Point and visit a secluded and very interesting Aboriginal rock art gallery to view Wandjina art and some of the Kimberley's most well-preserved Bradshaw Paintings (Gwion). Later, explore Red Cone Creek and enjoy a leisurely swim at Ruby Falls. Day 9: Cruise through the Buccaneer Archipelago, home to over 800 islands. In Talbot Bay the regions 12 metre tides create an amazing spectacle, the unique Horizontal Falls, described by legendary naturalist Sir David Attenborough as "one of the greatest natural wonders in the world". The amazing power of the falls is revealed when the regions 12 metre tides turn, forcing millions of litres of water to rush through the narrow gaps between cliffs. Board the zodiacs for an exhilarating ride through the falls. Later, explore Silica Beach on Hidden Island with its stunning white sands and crystal clear waters. Day 10: Cruise through Pender Bay and, subject to weather and tides, visit the Lacepede Islands, a series of low islands consisting of coarse sand and coral rubble lying atop a platform reef. This nature reserve has been identified by BirdLife International as an Important Bird Area as it supports up to 18,000 breeding pairs of Brown Boobies and Roseate Terns, possibly the largest such population in the world. Board the zodiacs and explore the islands lagoon, keeping an eye out for many species of marine bird life including Australian Pelicans, frigate birds, egrets, gulls and terns. The islands are also renowned as Western Australia's most significant breeding grounds for the Green Turtle, often seen nesting on the islands. This evening, enjoy the Captain's Farewell Cocktails. Cancellation Fees: pply for cruises cancelled inside 60 days of travel (up to 31 March 2017) and 90 days of travel (from 01 April 2017).